Here comes the Spike Brothers G Guardian from the BWC events! 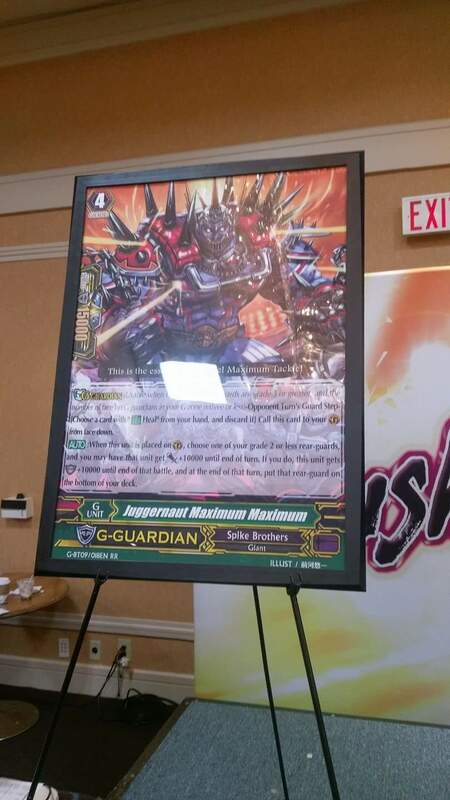 G Guardian (Usable when both fighters’ vanguards are grade 3 or greater, and the number of face up G guardians in your G zone is three or less) -Opponent Turn’s Guard Step- [Choose a card with “Heal” from your hand, and discard it] Call this card to your GC from face down. AUTO: When this unit is placed on GC, choose one of your grade 2 or less rear-guards, and you may have that unit get Power+10000 until end of turn. If you do, this unit gets Shield+10000 until end of that battle, and at the end of that turn, put that rear-guard on the bottom of your deck.